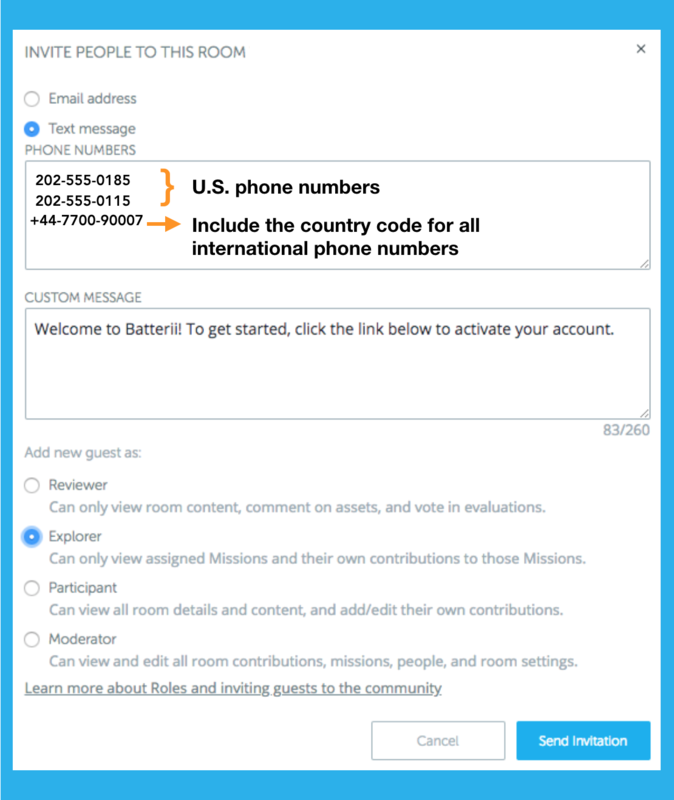 Invite someone into Batterii with only their mobile phone number. Believe it or not, not everyone is keeping close attention to their email inbox. Some people prefer to receive texts, which is why we've given you the convenient option of sending Batterii invites via SMS messages. 1. 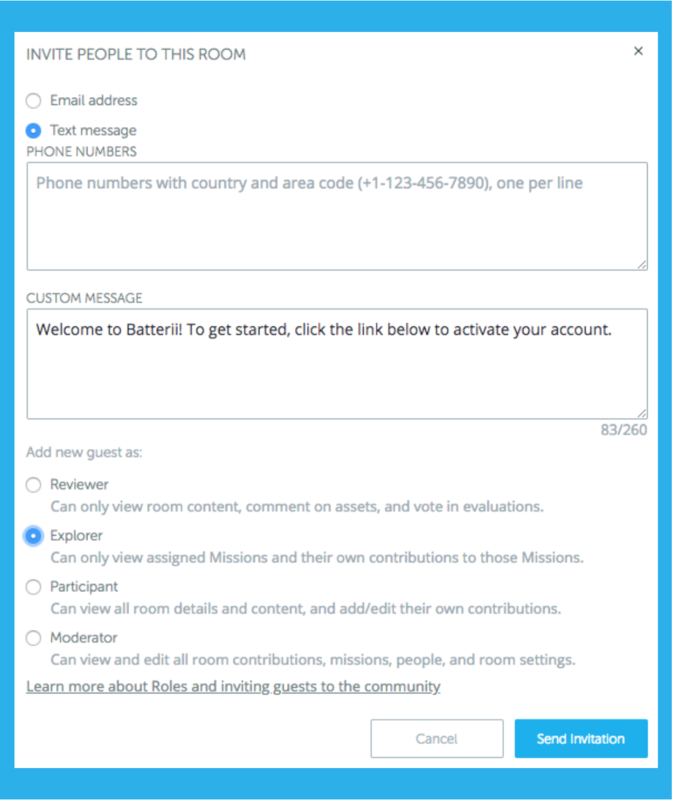 Go to the Room you want the new users to start in and select the People Dashboard. 2. Click the Invitations tab, then select the green button, Invite People. 3. The invitation form will pop up. By default, it will be set for Email Invitations. Click the radial button "Text Message" to switch to SMS Invitations. 4. Type in the phone number of who you want to invite. If you want to invite multiple people, write each phone number on a separate line. Be sure to include the area code for all all U.S. numbers and the country codes for any international phone numbers. 5. Add a custom message or leave the default message. 6. Select the role you'd like for them to have. 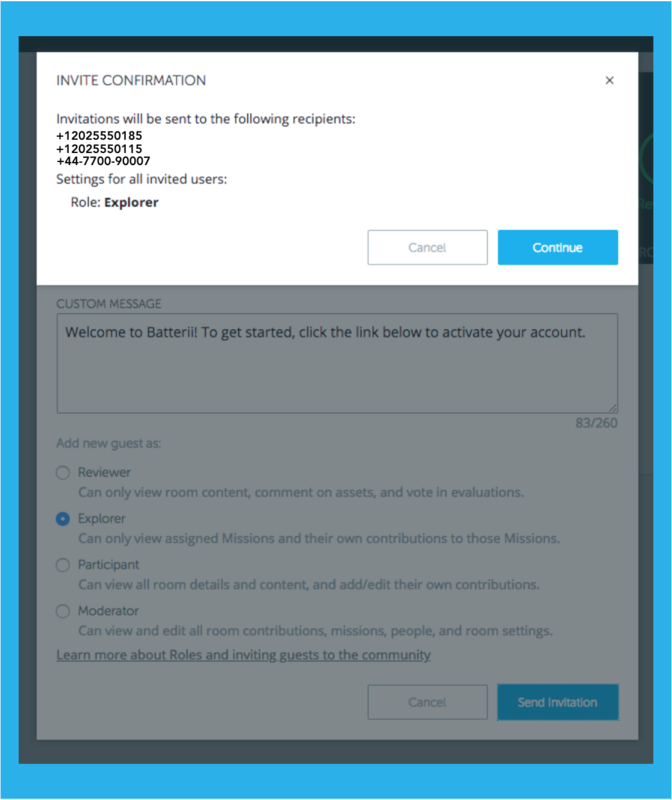 Please Note: Batterii Core Managers will not be able to invite Reviewers or Explorers. 7. Press the Send Invitation button. 8. A Confirmation Window will then appear. If everything appears to be correct, then press Continue. 9. After clicking Continue, your invitations will be sent out!